Wireless network (Wi-Fi) gives us the freedom to carry devices with us to surf the internet without using cluttered cables. There are a number of good Wi-Fi devices available and various manufacturers have their own advanced Wi-Fi devices and routers. Most of the new age Wi-Fi devices support a number of devices connected to it. You can connect your laptop, mobile phones to your Wi-Fi devices and can use it simultaneously. You can add your desktop to the list if you are having a wireless USB adapter, you will get USB wireless adapter from a number of manufacturers. Wi-Fi gives the freedom to move where ever you want to go. If it is in your house you will get a good Wi-Fi strength but if your outside in your garden and the Wi-Fi device is inside the room, there is a great chance to get a week connection, sometimes not. What to do? to get Wi-Fi range wherever you go. Today we are going look deep into extend the range of Wi-Fi device if we couldn’t extend the range of our device, we could do some tweaks that will definitely boost the wireless signal. Before you are going to do experiment with your WiFi connection, download an app or software like NETGEAR’s WiFi Analytics App to test WiFi strength in rooms throughout your home, helping you identify where your coverage is weakest. This is the first thing we could check. If we are setting in the home garden and the Wi-Fi device is inside the room, you may get a week signal. You have to arrange the device according to your device position. If your device having an external antenna, arrange it in a direction to get signals to your device. If the wireless device placed in some less height location, place it or fix it some somewhere on the wall or on top of a shelf or a table. Ensure that you will receive the signal without obstruction or interference. Placing it on top of the shelf or mount on some height the signal will be free from obstacles. Use an app or software to visualize your network coverage. There is a good list of mobile apps available for Wi-Fi analytics. Every device comes up with an inbuilt software called firmware. Check for firmware update available for your model from the manufacturer’s site. If a new firmware update is available (check the firmware version number with yours) update the firmware to the latest. For that, you need to download the firmware first and using the firmware admin panel you need to upgrade it to the latest version. If you are using a dual band router you can switch from 2.4GHz band to 5GHz band from the device administrator panel by providing the admin username and password. If you are using a single band router, it can only pick up the 2.4 GHz band, if you are using a dual band router, it can pick up both the 2.4 GHz and 5 GHz bands. The Dual-band routers broadcast on two different frequencies, 2.4 GHz, and 5 GHz. The 2.4 GHz is oversaturated with devices, almost every smartphone, tablet, laptop and cordless phones use this band. 5Ghz networks have a shorter range, but much high max throughput compared to 2.4Ghz networks. The maximum transfer speed on the 2.4GHz band is 145Mbps and the transfer speed on the 5GHz band can go up to 450Mbps. When you enable both bands on your Wireless router, two separate Wi-Fi networks are created. 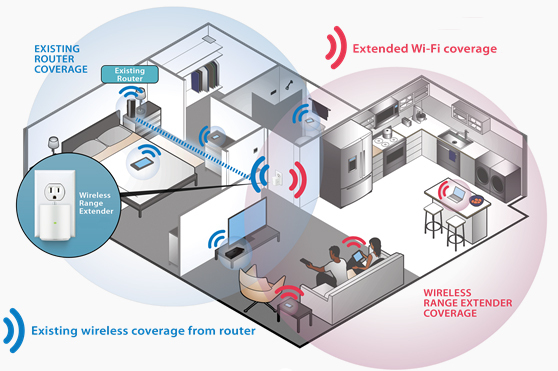 A Tri-Band Wi-Fi provides three wireless bands to accommodate more devices on a network. This is the best method if your device supports latest Wi-Fi standard. Check if your device supports the new 802.11n standard, then use it. The 802.11n standard offers far greater range and signal strength compared to 802.11 a/b/g. Due to metal appliances, architectural interference in a home, even the most powerful WiFi router can miss a few spots. If the house is big or in a big office set up the best solution is use a WiFi Range Extender. WiFi Range Extenders, also called WiFi Boosters, boost the existing WiFi in your home or office by receiving the wireless signals from your router and repeating them with powerful amplifiers and antennas, extending your coverage by up to twice the range. Yeh! your device has a good external wireless antenna with it. Then, you can increase its strength by replacing the antenna with a better one or using an antenna with a long cable, so you can mount it somewhere on the wall or somewhere above the obstacles. Now a lot of devices using the 2.4GHz wireless network, from cordless phone to microwave oven, wireless signals are common. This will cause interference if your router is close to cordless phone remove router to a distance from your cordless phone. Bluetooth sends signals over a 2.4GHz radio frequency, it may also cause interference.Get away your wireless device from Microwaves and Fluorescent Lighting as both emit frequencies of 2.4GHz. Mirror, metal, concrete, marble, bricks in our house will block Wi-Fi signals. These can create high interference in Wi-Fi signals. There is also frequency interference from the microwave oven, cordless phone, poorly wired satellite dish, wireless speakers, baby monitors, garage door openers, etc. Your neighbor’s Wi-Fi network can also affect if it is at short range. The powerful wi-fi networks in a close proximity can detract from each other’s performance. Wi-fi performance will always be inferior to wired performance, but Wi-Fi has its own advantages. The great advantage is we can move where ever we want. The recent innovations in the new 802.11ac frequency wireless and dual-band frequency wireless routers that can broadcast on both the 2.5Ghz and 5Ghz spectrum improved the efficiency of routers. If you are going to purchase a new router, buy a dual-band 802.11ac router and position the router in a place that avoids the wireless blocking materials as possible. You can use Wi-Fi range extenders or multiple routers setup in bridge mode on different floors to improve your Wi-Fi network and efficiency.